When it’s time to buy our pumpkins each fall, our little boys know that we choose a few to carve for Halloween and one to write on throughout the month of November. A few years ago I ran across the idea of a “thank you pumpkin,” and one has since become an annual tradition in our home. Starting on November 1, we take turns writing one thing we are each thankful for in a black Sharpie marker on our pumpkin. This designated pumpkin sits in the center of our dinner table throughout the month of November. It always brings joy and quite a bit of laughter to hear what our boys are thinking about or to see what they quietly and sneakily write on the pumpkin. We may be in our fourth year of having a “thank you pumpkin,” but this is building as one of my favorite years. Our boys are ages 8, 6, and 2 ½. Ever since they were little our nighttime prayer routine consists of me asking them to share a thank you prayer and someone for whom they would like to pray. For our older boys, this is a sacred time, and they truly seem to reflect on their answers. But the “thank you pumpkin” boasts the things in life that these boys are truly most grateful for. Topping the list this year has been: sweets, screen time, video games, and Halloween candy. A couple of years ago this would have made me crazy and would have brought on the lectures of privilege and circumstance and graciousness. But because these innocent offerings of thanks are intertwined with sincere gratefulness, I now appreciate the sweetness of the place that these thankful thoughts are birthed. “And what about God’s spirit, mom?” my oldest inquired. “I am thankful for heaven, too,” said our middle boy, “and thankful that is where we’ll play with all the Legos we want and will see Roxy and Gunner, too,” referring to our two Labradors that both died within the last few years. 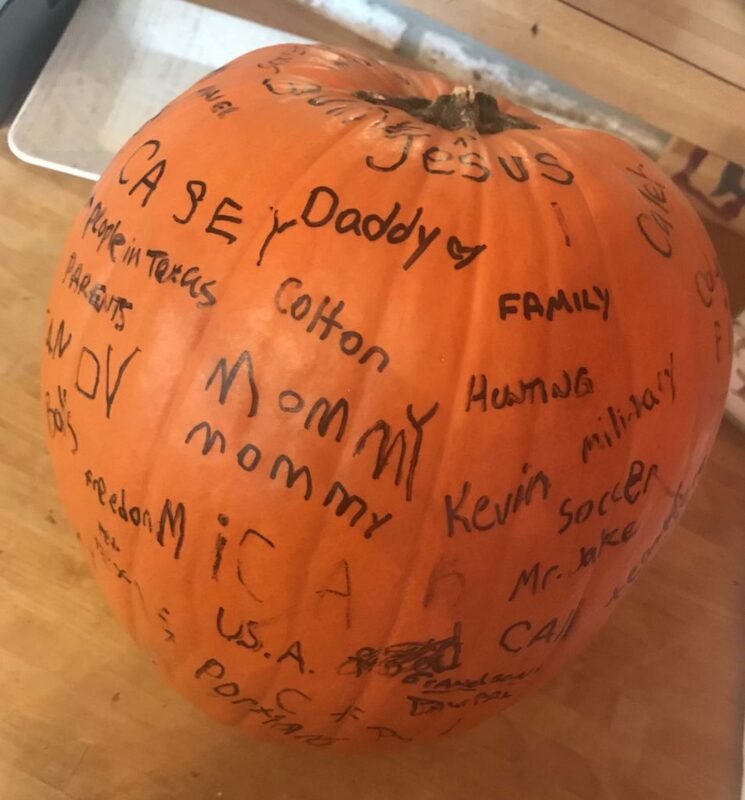 Our oldest son, who seems to have quite a heart for veterans and a thirst for knowledge of all things military, has made it a custom to list “freedom” and “soldiers” on our “thank you pumpkin.” And the littlest guy, stepping right up to the plate to participate this year, has wanted to write our current dog, “Ms. Bennet,” on the pumpkin every single evening. The range of things for which our boys are thankful is wide, no doubt about it, but I know beneath each thought and each response thankful hearts are being crafted.There is joy in picking out our “thank you pumpkin” in the patch each year, and there is joy in writing on it each evening. Very often it is the boys that remind us of our daily November activity. And my favorite part of this beloved tradition is it provides a gateway to for me to work in references to God’s Word. Sometimes – most times – it is in these brief moments that catch the boys’ attention and instill a value, a lesson, a resource for life. How will you share your thanksgivings this week? We did a version of the during parish breakfast last Sunday. There were slips of paper with prompts for what to consider. Answers were written on two pumpkins. The pumpkins were brought forward during the offering. Oh I love that. Thank you for sharing. Thank you! It will be such fun to watch how their responses change over the years.